MetalRockNews: Judas Priest's Rob Halford: "We can't afford to wait three years, or five years now, to make a new record"
Judas Priest's Rob Halford: "We can't afford to wait three years, or five years now, to make a new record"
Judas Priest frontman Rob Halford was interviewed by Jenn Marino at the Download Festival 2015, you can read some excerpts below. 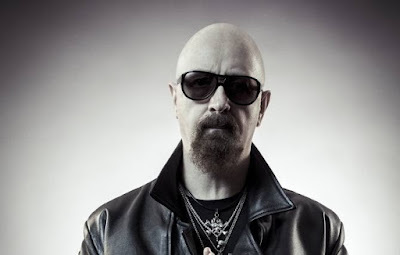 About what still blows him away about being in Judas Priest: "It's a lot of things, but in a nutshell, it's the persistence of these fans that we've got. And Nikki will tell you the same thing about Motley Crue fans, they're with you wherever you go, and it's, like, they'll wait for two, three years, maybe more, for you to come back to their town, their city. And it's just sensational to go out on the stage anywhere in the world and know that there's what we call the #priestfamily who's waiting for us. That still blows me away. I mean, I would never, kind of, preempt that that's what I expect, that should happen, because if you lose the fact that your fans have given you this life, then you need to do a reality check. We can't do this without our fans; our fans are our lifeblood, our fans give us this life in rock and roll. So that blows me away. And just the fact that you and I are sitting here, and I've been doing this for 41 years, and I still love it as much as I ever did, probably more so now. The passion and the determination… Again, I'm sure Nikki would say the same thing. When you put your gear on, and he straps his bass on, he's Nikki Sixx, and it's a different Nikki Sixx to the Nikki Sixx that we know. You change and you become that person that's important for your band and your fans." About Judas Priest's future: "Well, we have such an incredible reaction to latest album 'Redeemer Of Souls' that that really motivated us to crack the whip and get on with making the next record pretty quickly. The clock is ticking, you know. We can't afford to wait three years, or five years now, to make the record. And especially while we're having this great, kind of, vibe with the fans and just this massive Priest family love fest type of deal. You know, who wants to go home and sit down for a year? And especially while the band is buzzing and the energy's there creatively. We had so much stuff happening in the studio, we had to put the blocks on because we were on a time schedule with the label. So we do have some stuff kind of left over from 'Redeemer Of Souls'. Although Richie Faulkner, who's this crazy, non-stop, 24-hour guitar writing machine, he's just… Whenever I go in the dressing room, I go, 'What is that riff?' He goes, 'I don't know.' And I go 'Put that down. Save that one. Save that one.' So we've been accumulating all that since the start of this 'Redeemer Of Souls' tour. So, that's pretty much it. We'll be heading out for the rest of this tour 'till Christmas time, take a break, and then more than likely in the studio early of 2016 and see how quickly we can turn this around. It won't be a rush job, because we treasure everything that we do. But I think that the mindset is there to make this record efficiently and hopefully have it out there for our Priest family as soon as we can."